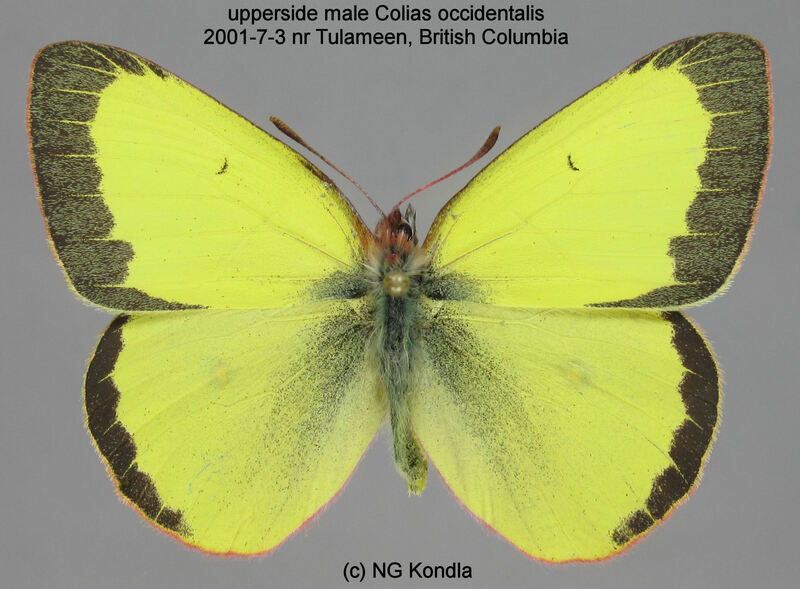 Identification: Upperside of male bright yellow with wide black border; orange morph is orange with yellow at costa and wing bases. Female pale yellow to greenish white with border blurry, incomplete, or absent; orange morph dull orange with wide black borders and dark veins. 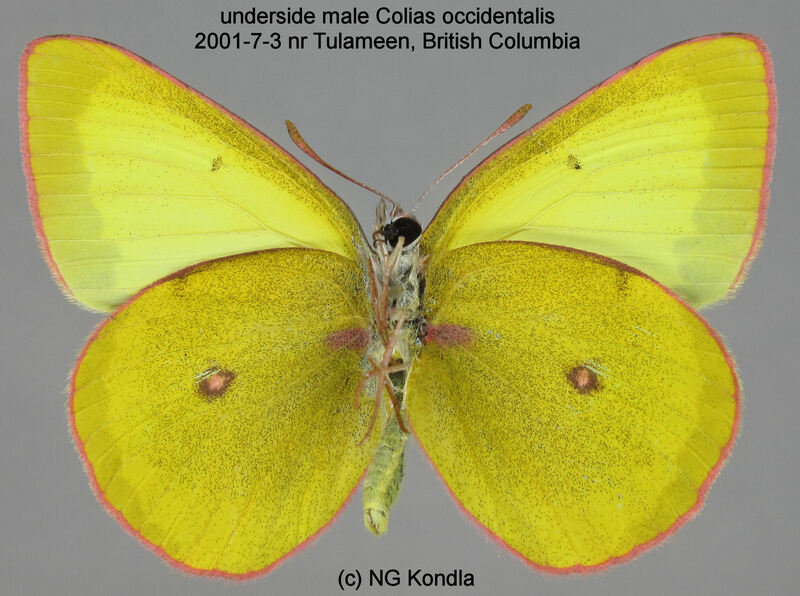 Underside of both sexes with pink wing fringes and golden yellow hindwing; orange morph green-gray to orange; both with dark overscales. Wing Span: 1 3/4 - 2 1/2 inches (4.5 - 6.3 cm). Life History: Males patrol in valleys or open areas near host plants for females. Females lay eggs singly on host plant leaves. Late-stage caterpillars hibernate. Caterpillar Hosts: Plants of the pea family (Fabaceae) including vetch (Vicia angustifolia), sweet vetch (Hedysarum), lupines (Lupinus), and white sweet clover (Melilotus alba). Habitat: Open areas including meadows, sagebrush flats, conifer forest openings, power-line cuts. Range: Extreme southern British Columbia and northwestern United States south to north coastal California and central Utah. Conservation: Some populations affected by grazing and fire suppression. NCGR: G3, G4 - Very rare or local throughout its range or found locally in a restricted range OR Apparently secure globally, though it might be quite rare in parts of its range, especially at the periphery. Subspecies chrysomelas is T2,T3 and is threatened by fire suppression, improper logging, and invasive alien weeds.